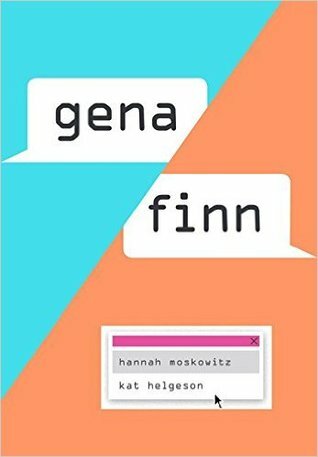 I think many people who 'live' an online life will appreciate the way Gena and Finn find each other, connect, and interact in the first half of the novel; it reads very true and for those of us who have experienced this first hand, we all smile and nod at how it evolves and the quickness with which it happens. For these same readers I think it's easy to see how real life experiences and people sometimes get the shaft because the person on the other side of the screen is the recipient of all of those journal entries you used to write to yourself and now you write to them. They've become the reservoir for all of your truths--maybe because it feels safer as the likelihood (initially) that you'll ever meet in real life seems so impossible. Or maybe it's because there is a real connection. Or maybe it's all of that and other things too. So we create this new life with a friend who really only sees you from your perspective and you only see them from theirs (and how you interact with others online) and it's fun and crazy and nuts and exciting--and that to me is the first half-to three-fourths of this novel. As Gena and Finn's real lives shift and change things with them do too and this also reads as very real. The bubble bursts and this place where things were good and comfortable doesn't really exist like it used to and it's so melancholy. And melancholy is exactly how I'd describe the ending; it's messy and uncomfortable and confusing and unresolved and very life-like. So I'm mixed on how I feel--I like the realism, even the harder parts, but the ending felt so unrelentingly real that it sometimes felt so hopeless and that was hard to work through for me. I should note that I'm not well read or informed enough to talk about how mental illness was portrayed but I wanted to note that it exists and I appreciated that aspect of it in this novel. I also appreciated the friendship/relationship and blurriness of how Gena and Finn feel about each other too. Not all of our relationships with others fit neatly in a box and I liked that this novel showed that. All in all, I look forward to reading more from Hannah Moskowitz and Kat Hegelson. The story follows the unlikely friendship of two young women forged via fan fiction and message boards, and is told entirely in texts, chats, and blog posts. Gena (short for Genevieve) and Finn (short for Stephanie) have little in common. Book-smart Gena is preparing to leave her posh boarding school for college; down-to-earth Finn is a twenty-something struggling to make ends meet in the big city. Gena’s romantic life is a series of reluctant one-night-stands; Finn is making a go of it with long-term boyfriend Charlie. But they share a passion for Up Below, a buddy cop TV show with a cult fan following. Gena is a darling of the fangirl scene, keeping a popular blog and writing fan fiction. Finn’s online life is a secret, even from Charlie. The pair spark an unlikely online friendship that deepens quickly (so quickly it scares them both), and as their individual “real” lives begin to fall apart, they increasingly seek shelter online, and with each other. For more information about this novel and the writers, check here.